The internet is a very crowded and overwhelming place and it can be incredibly difficult to get noticed among all the other stuff that is out there stealing the attention of your desires audience. Even if you are in a very specific field or industry there is so much competition and similar websites and businesses out there, getting noticed is next to impossible. You have created a website for your company (hopefully by using a WordPress theme to build it) and are getting more views and site visitors but you want to up your website’s business, but how can you do that? Once you have created your website and done all you can to include catchy text and images the next step is to create a more visually stunning and appealing website to help keep people on your site and give them a memorable experience. But what can you do to improve the look of your website and make it stand out from the crowd? Well how about incorporating one of the WordPress lightbox plugins? WordPress Lightbox Plugins, say What?! Great question! A WordPress lightbox plugin allows you to use the lightbox effect on the various content of your pages and posts. With many of these plugins you can add the effect on links images, videos and many other things. The lightbox effect is a popup overlay window that will go over your website and display your media files. Some of the plugins in our list let you do slightly more complex things like customize certain elements and allow you to exclude certain context from receiving the lightbox effect. So lets now check out some of the WordPress lightbox plugins you can choose from to see if it is something you want to use on your site and figure out which plugin may offer you the best features for your site. 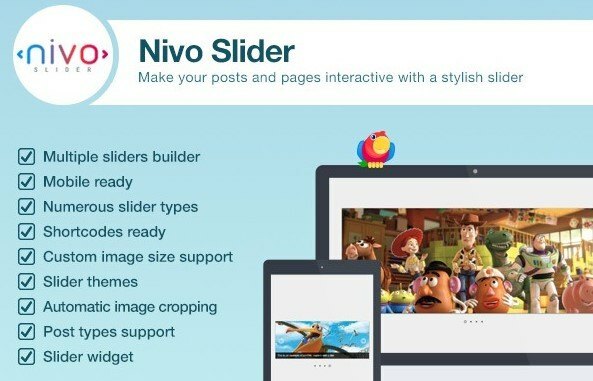 Let’s get our WordPress LightBox plugins list started with the Nivo Slider plugin, which is also known as the #1 responsive WordPress slider plugin . If you want to incorporate galleries and slideshows into your website posts and pages then this is the plugin for you. Because this plugin was meant to display tons of pictures it is a nice choice for photographers and other people who want to display a lot of images. You can customize the transitions of the slideshows within the Nivo Slider plugin’s setting and the slideshow itself will appear in a LightBox forum. This plugin is also mobile ready so it will look great on all screens even on tiny mobile ones. The Responsive Lightbox plugin is very user friendly and one of the most rated WordPress lightbox plugins. With it, you can use lightbox to display any of your image or video, links and product galleries, there are also custom galleries provided by Jetpack. There is a powerful and easy to use gallery builder so gallery creating and customizing will be a cinch. There are also 3 different gallery templates: Masonry, Slider, and Grid. The Responsive Lightbox plugin also work with the Visual Composer for even more customizing potential. This plugin is jam packed with add ons and extensions to offer you even more flexibility for customizing your lightbox. The next of our WordPress lighbox plugins is the Simple lightbox. If you are someone who likes things with minimal frills and is into a minimalist style then the Simple Lightbox plugin is right up your alley. With this plugin you can enable the lightbox feature for tons of elements like: posts, pages, menus, home page, categories and tags, widgets and more. You can also create slideshows for your images and control their effects and manage other elements of the slideshows like its transitions, animations and speed. If you want to do even more with this plugin you can have unlimited customizing potential with options from add ons that you can incorporate. We continue with the WP Featherlight plugin which will add a high performance and responsive Jquery lightbox to your WordPress site. The plugin displays all of your images and galleries in a lightbox popup, so you can sit back and relax while it does the work for you. If you have AJAX content or videos you can also add a lightbox to them should you want. This plugin is super simple and easy to set up , so if you aren’t so tech savvy you have nothing to worry about. All you have to do is install the plugin and then link any images or videos etc. you upload to the Media File option, and that’s it you are done. So if you are looking for something simple and easy to enhance the content of your website you should definitely look into WP Featherlight. 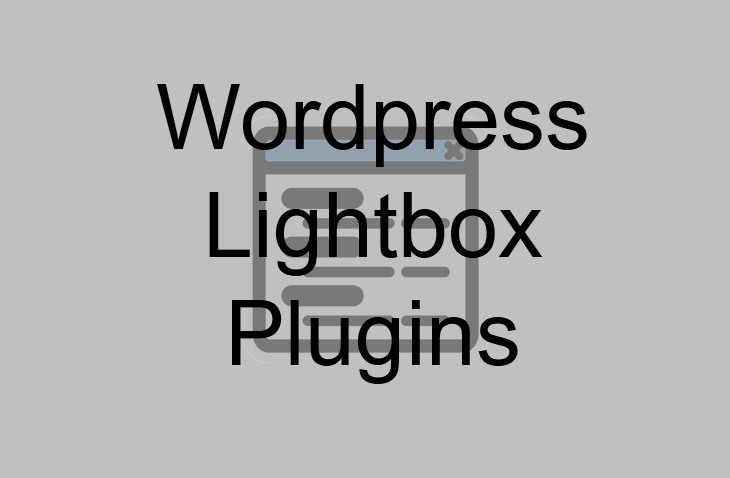 And we have come to number 5 of our WordPress Lightbox plugins with the Foobox plugin. This is THE plugin to get if you are super into having a plugin that takes its responsive design seriously. This plugin rearranges its button controls to look good on both landscape and portrait orientation and it can scale images by itself so your content will look good on mobile phone screens. With this plugin you have some control over which content and which pages have the elements of the plugin included, if you don’t want the lightbox effects you can choose to disable them. There is a new metabox feature that also now comes with the Foobox plugin. There is also a Foobox Pro option available should you want to have more features like video support and social sharing. With this next plugin you may be able to tell what it can do from its name. The WP Video lightbox plugin allows you to embed a video on a page and use the lightbox overlay display. With this plugin you can also display: images, iFrame, Vimeo an YouTube videos, etc. The plugin comes with lots of shortcodes to help set up your site with the different content and videos from various sites. It comes with simple instructions and steps to help you embed these videos. The videos you embed on your site can also be viewed on devices like iPads and iPhones. To learn more about the WP Video Lightbox plugin check out this video! The ARI Fancy Lightbox plugin is a great choice for anyone that wants to show various types of content in lightbox. This plugin is flexible so your content will be able to be viewed nicely from desktop to mobile. It uses Fancybox popup to give the content on your WordPress site a lightbox effect. You can use it to show Justified Image Grid and Jetpack galleries, PDF documents, videos from YouTube, DailyMotion, Vimeo etc., images, Google maps links, inline content and more!. This plugin is so easy to use, just install and choose which images you want to have the lightbox effect, there is no need to adjust any code or do anything else. The Easy Fancybox plugin gives you a flexible lightbox solution for almost all of the media links on your WordPress website. This plugin uses the updated version of the FancyBox Jquery extension and it can work with WP 3+ multi-site. The Easy Fancybox plugin also supports videos hosted by Youtube, Vimeo and Dailymotion. Once you have activated the plugin you will be able to manage the media lightbox options from the admin page. After activation everything is incredibly simple because all of the links from PNGs, JPGs, and GIFs will be automatically opened in the FancyBox MAC/Gnome-style lightbox which floats over the web page. If you are in the market for a very customizable lightbox plugin for your WordPress site then look no further than the Image and Video Lightbox plugin. This plugin is also responsive so it will look great on all different types of devices and various screen sizes. It is also super simple to use, just install and enable it, and use the admin panel for customizing. The Image and Video Lightbox plugin has also been tested on various web browsers and is cross browser compatible. This plugin also works on most of the popular WordPress themes so you don’t have to worry about it maybe not being compatible with your theme. The jQuery Colorbox WordPress plugin, the 10th of our WordPress lightbox plugins, is a lightbox/colorbox plugin to use with your site. This plugin features 11 different themes for you to choose from and it works right out of the box with WordPress galleries and NexGen gallery. All of the images that you have in your posts or pages can be easily shown in a lightbox or colorbox when the thumbnail, which is linked to the image, is clicked on. You can also show groups of images as a slideshow, instead of individual entities, within a lightbox or colorbox. Should you want to have certain images on your site be excluded from the effect of the lightbox or colorbox you will need to add a special CSS class for the excluded items. The JQuery Colorbox plugin also comes with loads of different language options to translate your plugin’s content to so people from all over the world can use your site. Number 12 of our WordPress lightbox plugins list is the WP jQuery Lightbox plugin. This particular plugin is a great and simple alternative to some of the other more complicated lightbox plugin options. It has minimized scripts and light weight functionality so it runs faster and better compared to other similar plugins. This plugin comes with files that are translation ready so if you want or need your site to be in a different language you easily have that flexibility with the WP jQuery Lightbox plugin. It also has an admin panel for any configuration you may want to do. Swipe gestures for moving between images when operating your site on a touch screen device. 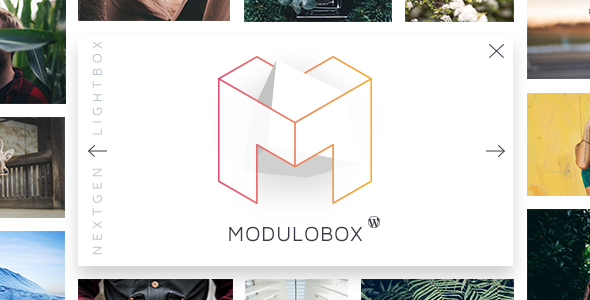 We move on now to the ModuloBox plugin which is an intuitive premium WordPress plugin. The Modulobox plugin is also responsive so it will work across all different devices from desktop to mobile. It can also work with many other famous plugins like: Jetpack, Visual Composer, Esential Grid, NextGen gallery and many more. The ModuloBox plugin has support for images, embedded videos from site like Vimeo and YouTube and HTML content. This plugin is also a great choice because it works very well on mobile phones and other touch screen devices because it has multi touch gestures support for swiping and zooming etc. You can also customize and extend your lightbox’s functionalities by using the options panel. And last but not least for our WordPress lightbox plugins list we have Popup Press. this is a premium plugin that is very feature rich and perfect for keeping your site’s visitors engaged. It is also super easy to use and customize so you can really get creative and make your website pop. Since Popup Press is fully customizable you can even create your lightbox to match the color scheme you have made for your website. There are also shortcodes available so there is no coding knowledge needed to use this plugin and customize it. And a very cool and useful tool that comes with this plugin is that it can keep track of user statistics which you can use to improve your site. Well I hope you have found a plugin from these WordPress lightbox plugins to use to give your site that extra something to help bring in more visitors to your site. more visitors means more views which can mean more money and improve your business. So you have nothing to loose, choose a lightbox plugin and start giving your site a more interesting visual appeal today.